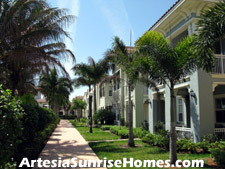 Welcome to the community of Artesia, located in the lovely and popular city of Sunrise, Florida. 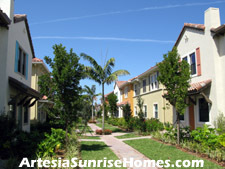 Artesia is a relatively new community, which was started in 2007 and is still currently being constructed. Here at Artesia you will find spacious townhomes that boast a very distinct design with the look, feel, and style of stylish European villas. The Artesia community was developed by Minto, a builder with a long history of building quality residences with lots of extra touches that you don't see with many other builders. As you drive past the guard gated entrance way, you will immediately note the lush tropical landscapes that envelop the neighborhood. The eye-catching kaleidoscope of colorful residences welcome you, and remind you of a picture postacard of a faraway and exotic locale. The residences here at Artesia come in a variety of floorplans and sizes, ensuring that you will find a layout that should meet the needs of your lifestyle. The residences here vary in size from 1,274 square feet under air to 2,830 square feet under air and come in 2 and 3 bedroom configurations. Artesia is conveniently located close to major highways, is just minutes away from the Sawgrass Mills Mall and Bank Atlantic Center, and near A-rated schools. Come see for yourself why residents love the Artesia community. Artesia can be conveniently accessed from both The Sawgrass Expressway and I-595. From the Sawgrass Expressway: Take the Oakland Park Boulevard Exit and make a right turn onto Flamingo Road. Make a right turn onto Panther Parkway (136th Avenue). From I-595: Take the Flamingo Road Exit and proceed North. Go past the Sawgrass Mills Mall and make a left turn onto Panther Parkway (136th Avenue). Call us today to schedule an appointment to see the lovely options avaiable to you here at Artesia.